Earlier this year I ordered 5 varieties of seeds from Wild Boar Farms. I was blown away with the number of distinct, beautiful and unusual tomatoes available. 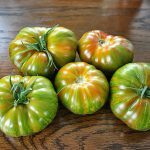 I stumbled onto this breeder’s varieties after looking for a good mix between OSU’s Indigo Rose and a tomato with some more desirable traits. The tomato I found created by Brad Gates that I now wanted to grow is called Blue Beauty. I was like a kid in the candy store on his site, and he ships all seeds for free, so I settled on 5, trying to be reasonable about what I could really grow this year. While I was organizing these new seeds into my catalog I noticed there was a stray seed outside one of the packets being held on by negative ions – the seeds come in small clear plastic resealable envelopes (which I prefer) instead of the old paper envelopes. I had no idea which variety it was, or even if it was one that I had ordered. The only logical thing to do was to grow it! I was glad that the seed germinated and the seedling grew strong unlike some of the other bad starts that had happened this season. It survived 2 weeks while we were on vacation, and kept growing. The blossoms set well and soon I was waiting on tiny tomatoes to grow big enough to get characteristics that could define which variety it was. The shape alone narrowed it down to 4 different varieties, but the patterns hadn’t been defined yet, so I had to wait some more. Finally the patterns started emerging and that narrowed it down to 3 varieties, but it also meant I’d have to wait for it to start ripening to determine the ripe skin traits, that narrowed it down to 2. I had to wait until it was fully ripe and cut into it before I found out it was a Berkeley Tie-Dye. Looking closely at this tomato is a thing of beauty. 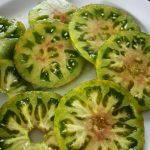 I didn’t know until that time that tomatoes could express different traits on the dermis and the sub-dermis – I also didn’t know they had a sub-dermis. The sub-dermis on the Berkeley Tie-Dye looks like it is under a layer of shellac. 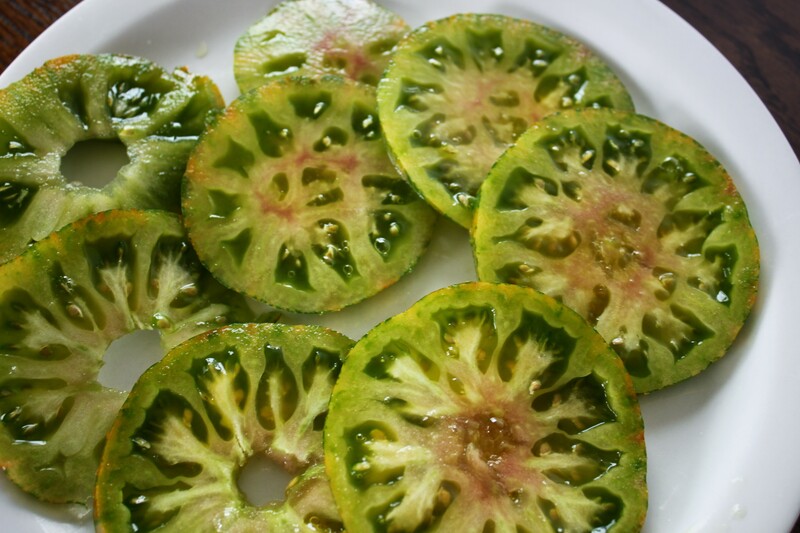 The interior of the first tomato was solid green, no pink blush, but others that have ripened had the blush. I believe the blush comes on when it is close to being overripe. 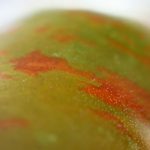 The dermis is a green color when ripe, the sub-dermis reddish-orange, the flesh is green with some pink in the center towards the bottom. It tastes a bit like a lime, but not too acidic. It makes a really great slicer, and the flesh is tender with numerous small pockets of gel. 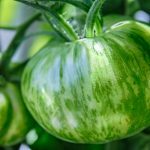 The tomatoes range from a nice round shape to oval with a stretched blossom scar, and occasional wrinkling. The stem attachment point is wide, and the core is about as deep as it is wide. I have had some slight cracking on some tomatoes, but I think that is due to a change in water moisture that had mostly been consistent; the skin is on the thicker side, but not overly so. Overall I would give this tomato an 8/10 rating, and would gladly grow it again. The plant is now 4.5 months old, and has started exhibiting signs of some kind of wilt. I had sterilized the soil it is in, but I think my project of connecting the containers together for easier automated watering allowed wilt to transfer over unfortunately. The plant seemed eager to grow well over 5′ tall, but I topped the growth off since it was growing indoors, in a 3 gallon container, and 5′ of tomato is more than enough indoors.